When we first moved in, a kitchen table (black) with a removable leaf and six chairs (black) to match moved in with us. Along with a variety of other outcasts – a giant, dignified floral couch that dwarfed the living room and its matching arm chair, a blue recliner with some questionable stains and a faint smell of smoke, a very pink chair, and a wooden rocker that made the count one too many for the space. A tacky coffee table with fake gold trim. My kitchen is small. Not tiny, but small, and it lacks counter space. So I kicked out the dining table and carved a dining nook out of my tiny living room (pink chair and huge couch moved to garage, rocking chair that my MIL nursed her babies in went home to their front porch), and bought a writing desk to use as a counter in the kitchen. 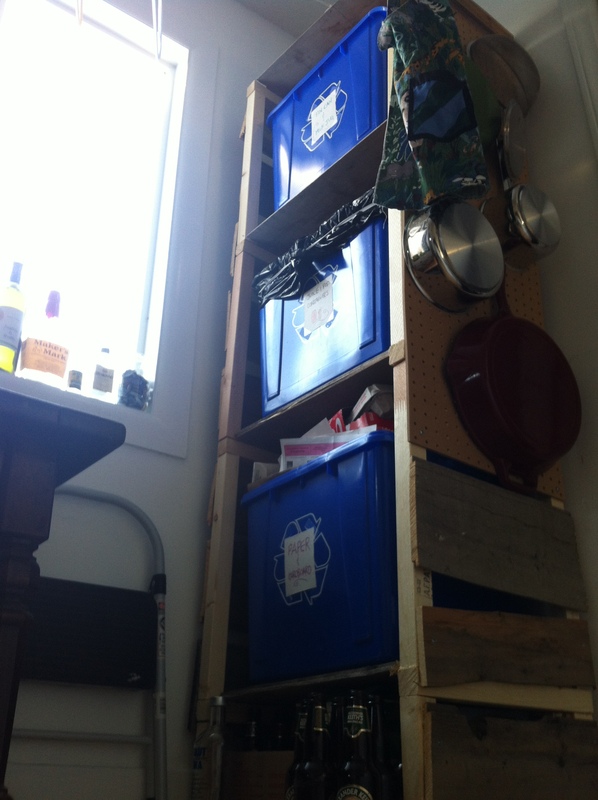 It also served as a cover for three blue bins to sort recycling into, and space the perfect height for herbs in the kitchen. Perfect! Soon after, we wanted space for homework in the living room, since the bedrooms are hardly big enough for a bed, and the parade of family visiting and using our house to crash means we do keep a spare bedroom. So the dining room table became a desk, but it wasn’t best suited to the task. We made do. Then the husband found a free piano, and just had to have it. At this point, we had to rearrange the entire living room to fit the piano in, and the dining table desk just wouldn’t do, so it went to live downstairs (I wasn’t about to give up space in my kitchen again), and the writing table found it’s true purpose fulfilled in it’s new role of desk. The herbs die in winter anyways. But now we had no dining area, no extra counter, and a mess of recycling. I kicked out the microwave and reclaimed some counter space – we don’t use it often, and stairs are good exercise when we do. A few months later I was beyond frustrated with the cluttered wall. “I don’t want to be in my kitchen, you cook lovely hubby” kind of frustrated. My dad had just dropped off some wood planks taken from the walls in the house I grew up in when my mom redesigned the floor plan, knocked out most of the walls, and added a sun room. I was planning to build some shelves to store homemade beer and salsa in the stairway, since it’s the only part of the house without a window. 3 hour job, max. And then I built this. It took us most of the weekend, and part of Monday. Crazy, for something so “rustic” looking. As in, this is not fine craftsmanship. Nope. But it holds my bins, and my pots, and the apron I made in grade 7 that still fits me better than any I’ve tried yet. Jack was a big part of the process. “Oh you’re trying to use a power tool? Let me help. Glue now? I want to play! A picture of it! ME, ME, ME!” This was the first photo that wasn’t mostly cat face. He seemed desperate to be a part of it, so here you go Jack, your tail’s famous. Not only did it free up two bins worth of floor space, my favourite frying pans no longer needed to live in the oven, and the most used pots aren’t in the ridiculous only-opens-half-way-because-whoever-designed-the-kitchen-didn’t-account-for-a-stove cupboard. The kitchen is obviously a redo. It matches the bathroom, and bits of the remodel were left in the garage when we moved in. So it can’t even be brushed off as a relic of older times with smaller stoves. Nope. Now to create a dining space in all that free space. I’m thinking floor dining. Cushions and a squat folding table for two are much easier to store and rearrange than six chairs (black) and their matching table (black). I was going to post a picture of chickadees – there were two in the apple tree in my front yard earlier this week, but I can’t find more than what might be a tail shape in the iPhone photo. I’m going to have to look into the iPhone telephoto lens. That or break out my old camera with zoom. It was my first city chickadee sighting! All in all, a great week. Categories: Home, Make | Tags: birds, diy, home, Jack, kitchen, pegboard, reclaimed, recycling | Permalink.